Why Race with Team Magic? Since 1985 Team Magic has been providing athletes with high quality multi-sport events in the southeast region. With our focus on excellence and fun, we have become a premier event management company for all racers. Come experience the magic where support and camaraderie yield fun in competition. Make your next race a Team Magic race. Elizabeth is from Ringgold, GA and is very active with the Chattanooga Track Club and Triathlon Club and volunteers for a wide array of sporting events around Chattanooga. 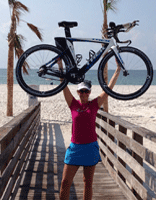 She started running after watching “The Biggest Loser” in 2006 and thought, “If those people can do it so can I.” She then became interested in triathlon when she volunteered to work a water-stop at the Chattanooga Waterfront Triathlon. Someone suggested she should try it since she was a runner and a swimmer, so she signed up the next year. Elizabeth says she loves Team Magic events because “They are so well organized and you can always expect a great race! And I like that Team Magic is a local business.” She advises everyone to, “Be strong, you never know who you are inspiring!” Check out Elizabeth’s bio on the Team Magic Ambassador webpage for some good tips she offers on “How to Stay Motivated to Train”.